Tetris Battle Gaiden (テトリス武闘外伝) is a competitive tetris game with crazy power-ups for the Super Famicom (Super Nintendo), released in Japan in 1993. Inspired by the Giantbomb dudes talking about this, I wanted to try it out. Emulation to the rescue! Jonas and I played a few rounds on ZSNES. 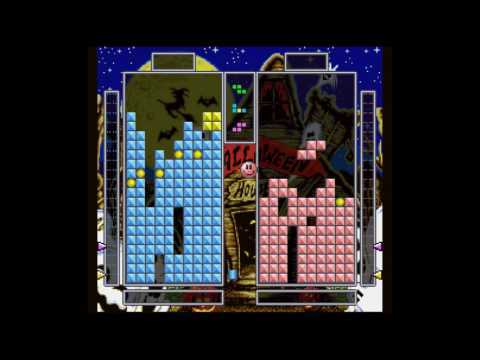 Still the most evil tetris variant. Nabaz and Jonas came by and engaged in some Tetris Battle. Pink Bunny is overpowered. completed the game with Pink Bunny on Easy difficulty (Single-player).